Analog Artist Digital World: Urban Sketching at Elite Animation. 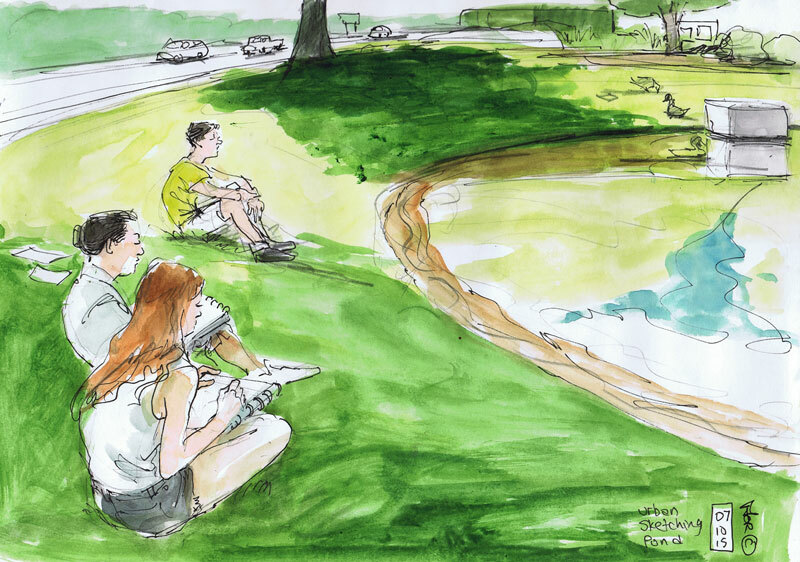 For the Urban Sketching Course I teach at Elite Animation Academy, I take the kids down to a local pond. We sketch the ducks who have just had chicks. If you stay very still, the mom a duck brings her chicks right up to you, assuming I suppose that we will feed them. It is a great opportunity to get quick sketches of them. They never stay still of course, so getting a sketch is a challenge. the students are also instructed to sketch the architecture of the shopping mall that i n eat to the lake. Finding the vanishing point is a challenge to many beginning Sketchers, but I point out the visual cues to each student one on one. Some kids just put the sketchbook aside and enjoy the sun. [ can lead them to water but I can't make teem drink. A little day dreaming is also part of the artistic process. When we get back to the classroom, we tape our favorite sketch on the board and have a mini art show.